A failed park and ride scheme in Preston would never have worked, the boss of Lancashire County Council says. Geoff Driver, leader of the Tory-led council, said: "People were never going to use it because of its location." The £2m park and ride scheme in Fulwood opened in 2009 but Lancashire County Council closed it in early 2011. The authority is working with two regeneration firms to assess the best use of redundant council properties including the park and ride car park. Mr Driver said a "proper feasibility study wasn't done" on the Bluebell Way site, which is close to junction 31A on the M6 motorway. "It is at a junction of the motorway where there aren't north or south facing junctions and not enough people used it," he said. 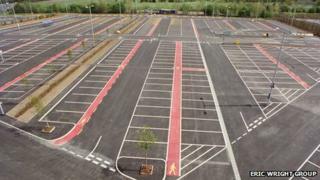 There are no fixed plans for the car park which has more than 500 spaces. A Lancashire County Council spokesman said there are no fixed plans for the site, which is locked up. "We are using expertise from the commercial sector on how to redevelop the site - there are a range of options from using it as a car park, disposing of it or applying to build on it but nothing has been decided yet," he said. It costs the council £1,000 a year to maintain the car park which was set up by the previous Labour administration.